Branded Saloon: Wednesday 01.30.13 - 7:30pm Terry Dame's Weird Wednesdays Series New music performed on original musical contraptions. 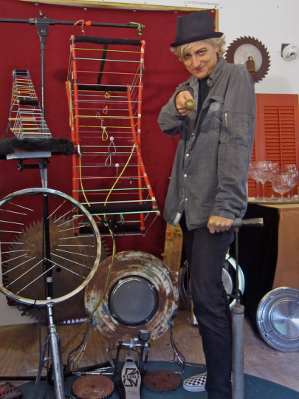 Wednesday 01.30.13 - 7:30pm Terry Dame's Weird Wednesdays Series New music performed on original musical contraptions. New music performed on original musical contraptions. Composer, instrumentalist and instrument inventor Terry Dame curates this new monthly series featuring performances by some of New York's finest instrument inventors, players of objects and other oddities. Dame, the mastermind behind the ensemble Electric Junkyard Gamelan will perform a solo set under the moniker "Electron Gong" on some of her original musical contraptions followed by two guest artists each month. You will be dazzled and amazed by beautiful sounds ranging from the ethereal and otherworldly to incredibly groovy, danceable beats created on everything from rubber bands to bike parts. Expect the unexpected!